These are always handy to have on hand, to look after your battery. Try to never fall into the orange area, and most certainly shut down if you get into the red area, you’ll be killing the battery. 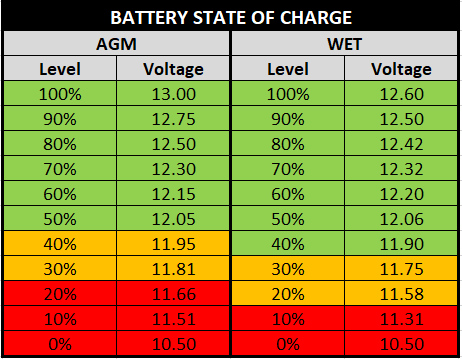 Note these voltages need to be read with nothing drawing on the battery for around 10 minutes or also (let the battery settle out) to get a true indication. I am continually needing to change peoples firewall profiles in my job as when Windows Updates come through or when connected to another network, people always seem to choose No, don’t allow my computer to be found on the network. This puts them into the public network category and locks their computer down. Problem is many a time they share or host data to other people, or you expect ICMP ping to respond around the network.